Normally I look at the water that is in the air, but in this one my eyes were also drawn to the waves produced in the water. Do you take many photos when you do this, and then select the one you like the best? And I love the angel eyes on your previous post - adorable! Beautiful flowers (?) in the drop! Excellent shot! What å perfect drop, Robert ! Congratulation Robert! On having your picture on "Macro of the day! I spent a few moments looking at your photos and trying to decide which to comment on. 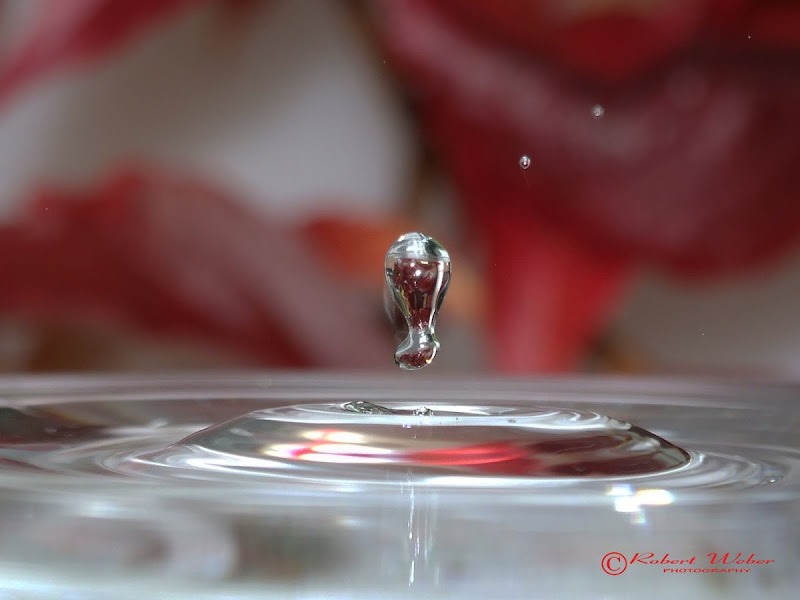 ths water drop is totaly awesome. I love it. you are truly talented. i came here from todays flowers and your guest photo grabbed my attention. and your Mother Teresa quote on your logo brougth tears to my eyes as i stared at the photo and read her words that i truly believe. Sure wish I had your camera! That is one great shot! Brilliant, awesome... thanks for the inspiration.